With a wealth of waterways snaking throughout the state, it's clear that outdoor enthusiasts in Mississippi both seek, and find, refuge on the water. One of the advantages to living this far south? You can basically paddle all winter. Epic kayak expeditions can be had on the mighty Mississippi River and in the Gulf Islands National Seashore, but there are also plenty of smaller creeks and rivers that crisscross the state, many of which are tailor-made for day or overnight float trips. People unfamiliar with the state may be surprised at some of the subtle beauty that Mississippi waters have to offer, but locals know all too well that it's a fantastic place to paddle. Here, KEEN and Buffalo Peak have assembled six great Mississippi waterways well worth a visit with your kayak. The Chunky is a short tributary of the Chickasawhay River in the Pascagoula River watershed. It forms near the town of Chunky, Mississippi and eventually flows into the Chickasawhay. The Chunky flows over rocky shoals as it moves east towards Alabama amid rolling, wooded hills. Near the town of Enterprise you’ll see Dunns Falls, a 65-foot waterfall created in the mid 1800’s to power a gristmill. It’s now open to visitors as a park, complete with the functional waterwheel. The Chunky also provides great fishing for bass, bream, and catfish. Fly fishermen consider the Chunky to be a top spot in the state, as the relatively clear water and rocky shoals give ample opportunity to hook up on the fly. Chunky River Recreation and Chunky River Canoe and Kayak can help you out with renting and/or shuttling your gear. As Mississippi’s only official National Wild and Scenic waterway, the Black Creek is a popular paddling destination in the summer months. Like several on this list, the Black Creek is a tributary of the Pascagoula River. It flows through stands of longleaf pine and hardwood bottomland in the DeSoto National Forest. The sandbars are plentiful and often hundreds of feet long, making perfect places to stop for lunch or to set up camp. Black Creek Canoe in Brooklyn offers kayak and canoe rental and shuttling for several trips of varying length on the Black Creek. The Leaf is part of the same watershed as the Black Creek, ultimately meeting the Chickasawhay to form the Pascagoula River. Compared to the rest of the waterways on this list, it is generally a larger river, so you can expect to encounter a bit more boat traffic. Still, it is a paddler’s paradise. Sandbars are frequent, and obstacles are usually few and far between. Sheer bluffs and steep banks can make landing sites a bit tricky, but they also contribute to the creation of shoals and occasional technical spots, and they're quite gorgeous to paddle past as well. 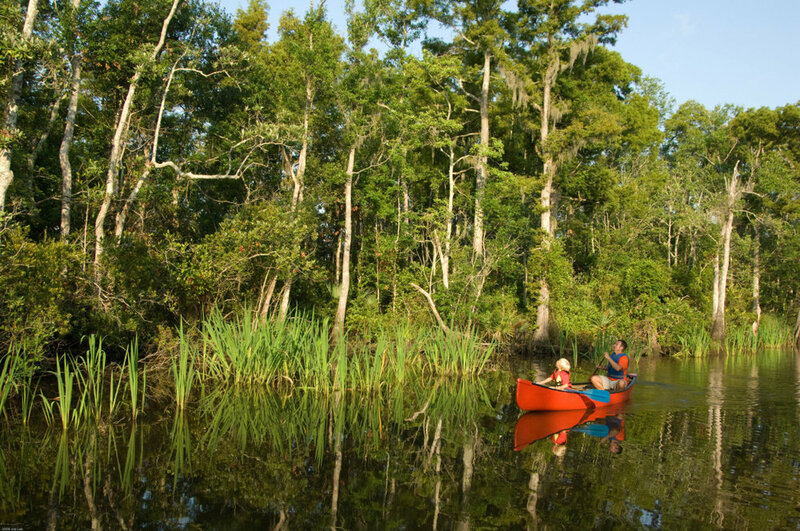 South Mississippi Canoe provides rentals and shuttling to several streams in the area, including the Leaf River. If you happen to be in northeast Mississippi with a free afternoon, you can’t go wrong by kayaking Bear Creek. In just a couple hours you can paddle through the beautiful, rocky terrain of Bear Creek Canyon in the Appalachian foothills, finishing under a swinging bridge in Tishomingo State Park. Located just off the Natchez Trace Parkway, Bear Creek provides some of the best scenery of any waterway in the state. If you want to make it easy, you can rent a kayak from the state park and get on one of the two daily trips they offer , covering just over six miles. The Strong, while not always true to its name, is a picturesque and iconic river that stretches 95-miles in south-central Mississippi. You may recognize the rocky section in the D’lo Water Park; it was there that the Coen Brothers filmed the sirens scene in “O, Brother Where Art Thou.” The Strong River has several shallow shoals similar to the one in this scene, especially in the upper section, where pullovers and portages can be frequent. When the water levels are between three and five feet, though, most of the river from Hwy 13 down is passable with minimal or no pullovers necessary. Eventually, the Strong empties into the Pearl River, which flows out to the Gulf of Mexico. The D’Lo Water Park provides rental and shuttle services, as well as a campground and other facilities. On summer weekends, the Okatoma is a pretty popular spot in south-central Mississippi. With the water at normal levels, it covers a wide range of paddling dynamics. From wide, lazy stretches to faster portions with chutes, riffles, and rapids, the Okatoma has something for beginner and advanced kayakers alike. The numerous launches and takeout points make it simple to plan out a trip to fit your group’s needs and skill levels. If you need to rent or just transport your boat, Seminary Canoe Rental and Okatoma Outdoor Post have everything to get you on the water. Of course, always check water levels before going on any float trip—low water can mean you'll be dragging your boat more than paddling it, and high water can send you on a collision course with obstacles that would normally be above your head. Here's a waterproof hiking boot that offers four-wheel-drive performance for your feet. It's designed to keep your feet dry and let them breathe, and the aggressive outsole bites into the terrain. The mid-cut height adds ankle support. Come see the full KEEN selection at Buffalo Peak Outfitters.